This famous Akhandalamani temple, the abode of “Lord Siva” is nicely located in the bank of river Baitarani, at Aradi, 37km away from the district head quarter of Bhadrak towards east by road via Asurali, Kothara and Dhusuri. This place is also linked with Chanbali by boat through the river Baitarani. From Chandbali ferry ghat to Aradi it will take hardly 2 hrs by boat. The present main temple of Aradi was built by the King of Konika Shri Harihara Bhanja and his chief queen Satyabhama Patadei. The height of the temple is around 150 ft. All the stones used in this temple were brought from the historic hill of Lalitgiri near Chandikhol. The entrance main Hall was built by a sage named Shri Narasingha Pratap Kumar and the surrounding wall of the temple was built by a noted sage named Shri Darshan Sekhara Das. Their are many fairs and festivals observed at the temple of Baba Akhandalamani, but the principal among them is the Mahasivaratri. On this day pilgrims and devotees inside and outside the state are assembled and worship Akhandalamani at Aradi. BOOL-BOOM devotees come to Aradi in large number from different areas in the month of Sravana to worship the God and pour holy water over the LINGA. The BOOL-BOOM devotees carry holy water from different rivers of India like Ganges, Baitarani, Mahanadi, Salandi etc with a bamboo lever. Lord Akhandalamani is unique and omnipotent. 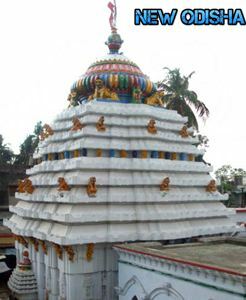 Give Responses for "Baba Akhandalmani Shiva Temple of Bhadrak"